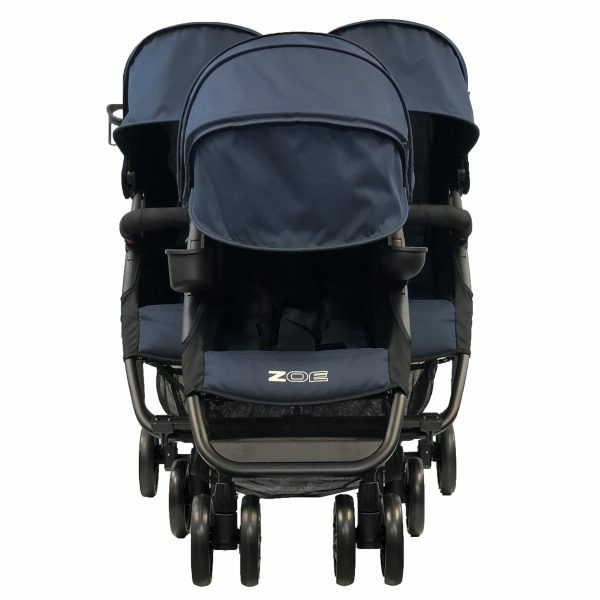 Home Strollers Triple Strollers Sneak Peak: ZOE XL3 BEST v2 Triple Stroller! Wow! 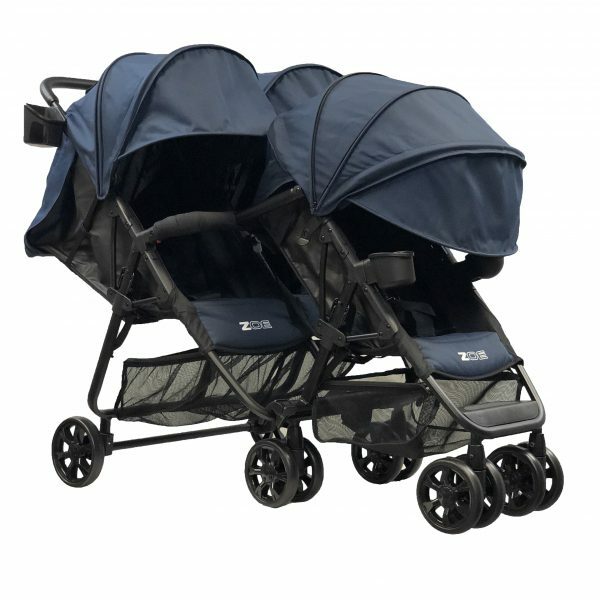 Have you heard of the new Zoe XL3 triple stroller? This cool new optional double or triple stroller literally just came out of nowhere. Zoe has made a huge splash over the past few years, quickly being known as the leader of the lightweight, compact, put in the overhead of an airplane stroller category. They also launched arguably the very best lightweight double stroller on the market with their XL2 best V2 model. Now, they have come out with what is called the XL2 triple tandem seat which snaps onto the front of their XL2 v2 stroller much like their XL1 single tandem seat snaps onto the front of the XL1. 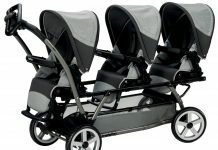 So this triple tandem seat converts their double stroller into a triple stroller! There’s quite a few reasons why the new XL3 is absolutely awesome and revolutionary. The stroller is literally a dream come true for all triplet moms out there and parents of twins who also have a younger or older sibling. As mentioned, the stroller can be used as a double stroller or a triple stroller. So if you already own the XL2, you can simply just buy the triple add-on seat or if you do not already own the XL2, you can purchase the entire triple stroller as a combo kit, aptly named the XL3. So beyond the fact that this double stroller can be used also is a triple stroller and vice versa, a few other things stick out as well. The XL3 weighs just 25 pounds! That’s the same weight if not less than many single strollers out there. 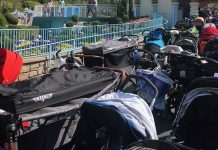 It’s significantly less than most double strollers, even ones that say they are lightweight, and it’s about half the way of any of the triple strollers out there. In addition to being extremely lightweight the XL3 can fit through all standard doorways. Sure, if you get a triple tandem stroller you could fit through doorways as well technically in terms of the width but by the time you push that super long stroller through a doorway you’re bumping into all kinds of stuff in the front and the back as you walk through. There are no triple strollers that are three wide they can fit through a standard doorway. Heck, they can’t even fit through aisles at the mall or grocery store. So this is really a dream come true in terms of mobility with three children. It’s actually completely unheard of in a full-size triple stroller. In addition, the XL3 triple will have two huge baskets, three huge canopies, three deep reclining seats, six large wheels (which is amazing)! The list goes on and on! Zoe has only released limited information on the XL3 so far. As we know more and find out more especially price and other details like pre-order and shipping dates, we will definitely update this post and eventually hope to do a full hands on review of this product. From what we can tell, the XL3 is set to be the absolute perfect triple stroller and a very revolutionary product, much like Zoe’s other strollers and high chairs. We are definitely super impressed so far! Extended Sneak Peak! 2017 ZOE XL2 BEST v2 Double Stroller! ZOE XL2 BEST v2 Double Stroller LIVE at Disney World! Previous articleShould I Buy a Double or Triple Stroller? Next article104 Fun Things to Do With Your Kids Today in Charlotte, North Carolina! Wow,so versatile!love to win this! Yeah!!! You are so cool why? New contest and it’s my Birthday!! This would make an awesome present for a disabled shot during car jacking incident) grandmother and caretaker of 4 and it would make those trips to the park and around town so much easier! Thank you so very kindly for the opportunity of a lifetime! I’ve searched every website for triple strollers for more affordable prices. When you become a first time mom of unexpected triplets you think$ 1 income changes your whole life! This would be amazing I currently use a double snap and go and a single stroller if my husband and I walk or rarely take two and carry 1. This looks amazing if I have money come tax time 2019 I for sure want to buy this. Would deffinately give me my independence back. I rarely lrave the house with the trio!!! I must add my birthday is oct 4th and the trio is turning 1 Nov 4th. 3 months premature was a long rollercoaster. Would be a great bday to me or them for me lol. Thanks for the opportunity.